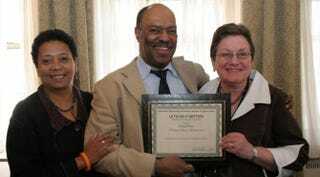 Dori Maynard, left, Richard Prince and Arlene Morgan, then director of the Let’s Do It Better! Workshop on Journalism, Race and Ethnicity at the Columbia University School of Journalism in 2007. Prince was one of the award winners. After more than 13 years, "Richard Prince's Journal-isms," the leading column on diversity issues in the news business, and the Maynard Institute for Journalism Education are parting ways. Prince said the Maynard Institute notified him Feb. 17 via telephone and email, "After much deliberation, the Board of Directors has decided the Journal-isms column is no longer as critical as it has been toward the Institute achieving its goals and aspirations. . . . given new initiatives needing funding and strategic considerations, we can no longer allocate resources to it." “I’m disappointed, but I’m thankful to Dori Maynard, the late president of the Maynard Institute for Journalism Education, for the idea that resulted in an online version of 'Journal-isms' 13 1/2 years ago,” said Prince, a veteran journalist who in 2002 began chronicling online the intersection of news media, race, society and newsroom diversity. Prince is meeting with colleagues, foundations and other partners to help underwrite the expenses of the column. Interested partners should contact Neil Foote, Foote Communications,LLC, at neil@neilfoote.com or 214-448-3765. "Very few stories of this degree of criticality are covered in their entirety, in real time, by a single highly authoritative publication," said David Honig, president emeritus and general counsel of the Multicultural Media Telecom and Internet Council (MMTC). "Journal-isms is a rare exception to the rule that 'you can never find it all in one place.' If it’s important to minorities in the media, it was in Journal-isms." Arlene Notoro Morgan, assistant dean for external affairs at Temple University's School of Media and Communication in Philadelphia, echoes those thoughts. "I have come to depend on Richard's column as one of my main avenues of news and information on how we are doing as a profession in meeting the needs of our diverse communities," she said. "The Journal-isms column is needed more than ever to document how the media are covering the racial turmoil of the past couple of years and solving the still unresolved issues on how to improve the thought processes of our news organizations in the digital age." Prince and a committee of "Journal-isms" supporters had already been exploring new options for its next iteration. These include moving to a subscription-based model. The first iteration of "Journal-isms" was a column from 1991 to 1998 in the printed NABJ Journal, published by the National Association of Black Journalists. In 2012, Prince received the Ida B. Wells Award from the National Association of Black Journalists and the Medill School at Northwestern University , largely for producing the online "Journal-isms," which in 2015 accounted for 43.25 percent of page views on the Maynard Institute site. The column also appears on The Root. Comments may be directed to journal-isms-owner@yahoogroups.com. Media inquiries should be directed to Neil Foote, neil@neilfoote.com.